Scuffles broke out between opposition and riot police after protesters forced their way into the offices of a public broadcaster in Belgrade, demanding they be put on air. Police resorted to force to evict the crowd. Protesters against the government of Serbian president Aleksandar Vucic stormed the headquarters of the country’s public broadcaster RTS on Saturday evening. Tensions were running high early in the day when huge crowds of opposition activists swarmed the streets to march to the RTS offices to call for more press freedom. The protesters initially planned to stage a 2-hour sit-in in front of the building housing. However, the situation soon spiraled out of control. 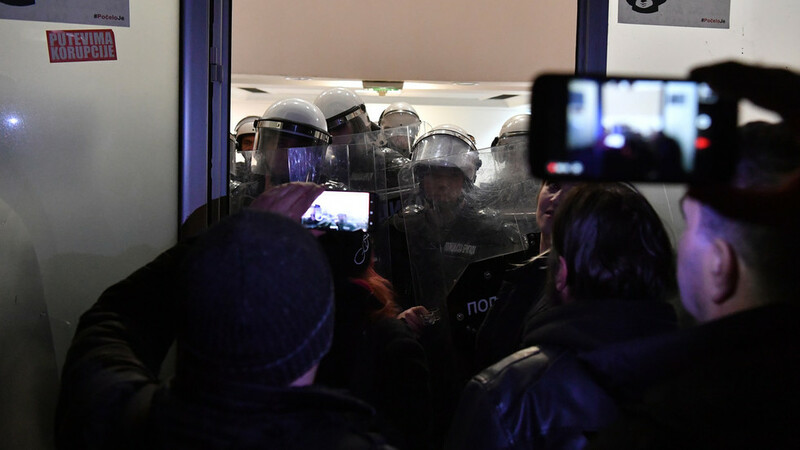 While they were chanting slogans outside, a group of protesters led by the leader of right-wing Dveri party Bosko Obradovic and his ally, prominent oppositional politician Dragan Djilas, stormed the officers, occupying several floors. As the opposition attempted to take over the state TV, riot police blocked entrances to the building, preventing more people from sneaking onto the premises while calling on the activists hunkered down inside to come out voluntarily. Protesters also plastered the walls and doors of the officers with a tape reading “It has begun,” one of the slogans of the ‘1 od 5 miliona’ (“one of five million”) protests that have been gripping Serbia since November last year following an attack on opposition politician Borko Stefanovic and several other attacks on outspoken government critics. “We won’t resist. We are not here for any kind of violence,” Obradovic said, as reported by the Balkan Insight. Videos have surfaced on social media showing police rounding up protesters and dragging them from the building, as they put up a fierce resistance. Defense Minister Aleksandar Vulin referred called the protesters who occupied the RTS offices “fascists,” demanding they receive harsh punishment for their actions. The ‘One of five million’ movement decries the Serbian government’s human rights record, demands more respect to civil freedoms, including the freedom of the press. Its name was inspired by Vucic’s remark that he won’t cater to the protesters even if “five million show up on the streets,” which is two million less than the total population of Serbia.